Yesterday, Overwatch’s 10th competitive season kicked off, bringing the game’s newest hero, flail-swinging stun machine Brigitte, into the mix. Today, Reinhardt mains are threatening to quit. If you’re a big ol’ block of meat hoping to hunker down on the frontline, consider yourself on an involuntary hunker strike. Brigitte is highly adept at wading through shields and using her bash ability to stun tanks, especially main tanks like Reinhardt. Want to retaliate with your giant hammer or ape science lightning gun? Not so fast. Brigitte can also use her flail’s whip shot ability to knock you back and create space, shortly before stunning you again. These things aren’t unavoidable, but if Brigitte is paired with another knockback-intensive hero like Doomfist, the situation can become pretty dire. Reinhardt is basically helpless here, getting alternately stunned and bounced around like a tennis ball in a crowded dog park. Situations like this have led players to worry that Overwatch is becoming too focused on stuns, knockback, and other crowd control abilities. These can be frustrating to deal with because you’re temporarily helpless if somebody lands one on you. Some people are already suggesting balance changes. Liam “Mangachu” Campbell of Overwatch League team NYXL’s minor league outfit XL2 thinks Brigitte’s shield bash’s cooldown should be longer and her ult should be less powerful. Players on Overwatch’s official forums, meanwhile, will take any nerf they can get. Of course, Brigitte hasn’t even been in competitive for 24 hours. It’s clear that she’s shaking up the previously stale meta—making life difficult for flankers like Genji and Tracer as well as tanks like Reinhardt and Winston—but she’s not uncounterable. She’s slow and melee-oriented, leaving her open to attack from mobile characters with range or a good old-fashioned explosive barrage from Junkrat or Pharah. There’s also something to be said for a Reinhardt paired with a Zarya, who can bubble-shield Rein and render Brigitte’s stuns ineffective. Once she’s out of place, Rein can flatten her. Orisa, meanwhile, is probably the most viable main tank at the moment, given that she has an ability that temporarily negates stuns, allowing you to bait Brigitte, get her to blow her ability, and then lay waste to her. Muma’s team’s Brigitte stuns the enemy Reinhardt, and then Muma, playing Reinhardt for his own team, runs roughshod over everybody. This kind of strategy, however, can still be annoying for Reinhardts, as it does not solve the problem of him getting stunned and bounced all the time. 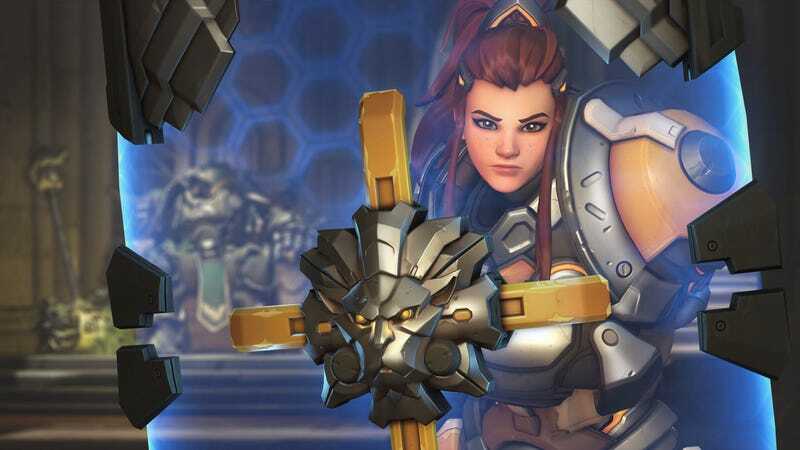 Again, though, Brigitte’s a new addition to the roster—an agent of chaos in a meta that, not too long ago, people were decrying for being too stale. Now change has beaten down their front door, and they’re not happy about that, either. It’s The Cycle of Video Games, which is a lot like The Circle Of Life, except with less lions and more yelling. In a couple weeks or a month, things could look totally different. Everybody might be running comps that render Brigitte useless. Until then, it seems that tanks will just have to do what they’ve always done when under pressure: grin and bear it.